It is clear that God knows our hearts. God knew what was on Zechariah’s heart when he was in the Holy Place. Zechariah does not trust the message or the messenger, and by inference – he does not trust God. God knows his heart; and disciplines this good man. Like Zechariah, we, too, may disbelieve God. In our sophistication or position in life we may say “Well that’s fine, but, the Scriptures don’t apply to our situation, or this specific teaching was acceptable years ago, but, too much time has passed and it doesn’t apply to my problems. Remember, the Gospel says that Zechariah and his wife were good and righteous people. It was mentioned that he kept all the Commandments and ordinances. Yet, when his big moment comes – where is all that goodness and righteousness? It might still be there in his heart, but, there was also a pocket of doubt – a crevice of skepticism – that was significant enough for him, as a priest of the Almighty God, to be struck speechless in punishment for not trusting Gabriel’s message. As sacred artists, as Christians, this Gospel asks us to stop, and check our souls in this last week of Advent. It asks us how patient, confident, and trusting have we been of the Lord’s message to our hearts, and have we allowed this to carry over into our actions? Zechariah learned the hard way that when the Lord prepares us for His coming He desires us to be alive, awake, and alert to His call and to trust His message. So, our prayer this week should echo that of Zechariah, who in the months of speechless waiting, most likely in his mental prayer said, “Lord, I believe; cleanse me of my disbelief. 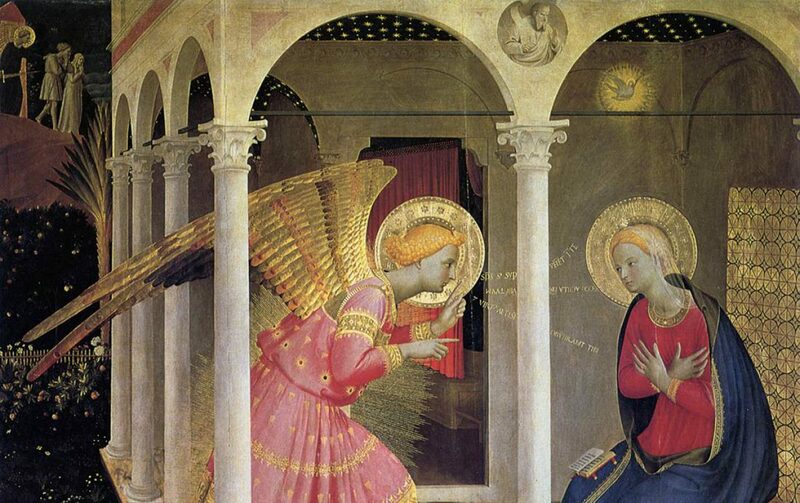 Lord, I trust, heal me of my distrust;” and it should also echo that of Mary – who in humility and expectation waited patiently for the graciousness of the Lord to take fruit in her womb. Thanks to angels-angelology.com for stained glass window image.